ResidentDante: In Russia Singularity plays you! Another update folks! My impressions of games are flying on my blog lately. So many games, so little time! At the time of writing I have started playing Assassins Creed Brotherhood and completed Call of Duty Black Ops on veteran difficulty. Impressions of those games later on though. This week’s update is about Singularity. Actually you may have missed Singularity, I sure almost did. It was released very anonymously earlier this year. Strangely enough I heard Activision weren’t happy with the sales of this game, but I blame them for not promoting it enough. This game simply passed by me, and only lately I picked it up really cheap. Singularity takes place on the fictional island of Katorga-12, an earlier Soviet owned island. I doubt it exists at all in real life, but then again neither does the new super energy source the Soviets have found in the games storyline either! The new element found is called E99 and has given the Soviets enormous powers and abilities. The game is set in 2010, but there are many flashbacks to the cold war and the development of E99. The game largely revolves around the concept of time travel. This gives room for some really good plot twists and scenarios along the way. You arrive at the island as an US elite force, going to the island to investigate what is happening there. However a large explosion grounds the team and you are quickly stranded alone. I like how a game again dares to put you alone, instead of with a gang of retarded AI teammates. This helps build the dark and creepy atmosphere of the island. You see the island inhabitants aren't exactly human anymore! To compare this game with other first person shooters I would say it’s a cross between Bioshock and Half-Life 2. Actually I think that comparison is spot on. The story and atmosphere, combined with the juggling between traditional firearms in one hand and special abilities in the other is clearly borrowed from Bioshock. While the puzzle elements are from HL2 and are all built around physics and the way you need to use the time and gravity element to change the environment. You can pick up objects to climb on and you can send objects back and forwards through time to either destroy or build them up. This combination of shooting against varied and different types enemies, combined with the storytelling, special abilities and environment puzzles make a really solid game. While it never goes to the heights of Bioshock complex story or the depth of HL2’s gameplay it does a great job of combining both. It was an unexpected experience for me, and took me by surprise as being very entertaining since my expectations were low. The game even lets you collect E99 “cash” to buy upgrades and abilities, making it even more varied. 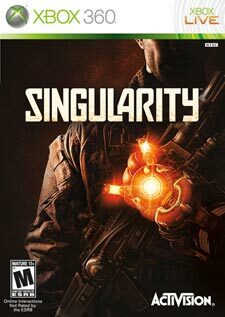 All in all if you enjoyed Bioshock and Half-Life 2 I would have to say that picking up Singularity is well recommended. The shooting is solid and should give gamers quite a challenge. At times the difficulty is rather challenging. In fact I would not recommend the game for people who simply play FPS games for the shooting. You need to get the story, atmosphere and variation in singularity to really enjoy it, play it steady and don’t rush it. As with most shooters though, it is a short experience, and you are really just getting into things when it’s over. I would have liked it being longer, can’t FPS games learn this from the Half-Life games about length?! I'll be back in a short while with my impressions on CoD Black Ops and maybe a look back at an old classic.